Itasca, IL - February 9, 2016 As Valentine’s Day approaches, thoughts turn to cupid. 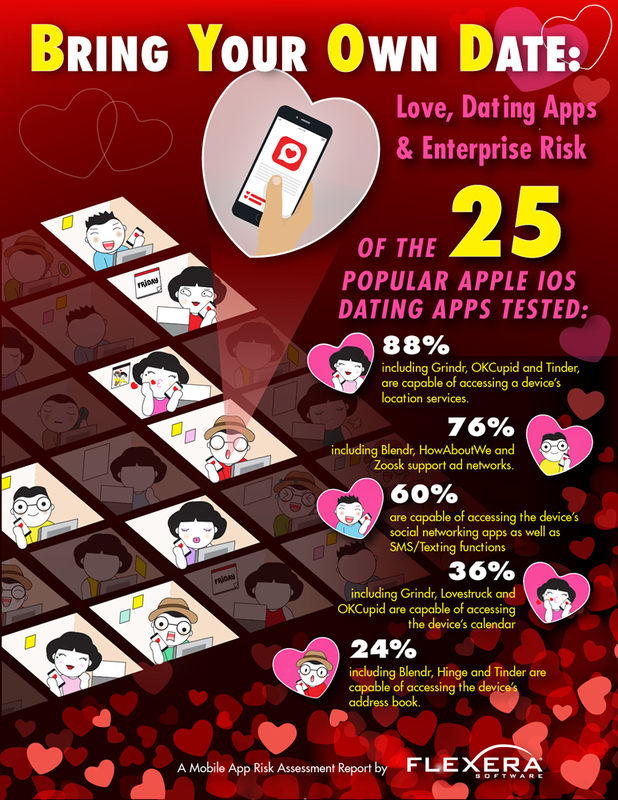 So in this age of Bring Your Own Device (BYOD) and high-tech dating, CIO’s must consider a novel question: do the dating apps employees might be using on their corporate-issued or BYOD phones present a potential security risk to the organization? According to a new report from Application Readiness expert, Flexera Software, the functionality and behavior of many popular dating apps could violate organizations’ BYOD policies. 88 percent, including Grindr, OKCupid and Tinder, are capable of accessing a device’s location services. 76 percent, including Blendr, HowAboutWe and Zoosk, support ad networks. 36 percent, including Grindr, Lovestruck and OKCupid, are capable of accessing the device’s calendar. 24 percent, including Blendr, Hinge and Tinder, are capable of accessing the device’s address book. Apps capable of these behaviors may or may not be risky – depending upon an organization’s particular business, risk profile and BYOD policies. For instance, customer location data can be highly valued by companies targeting consumer behaviors, so many apps access the phone’s GPS data to pass along to advertisers. Confidentiality and privacy concerns in some organizations would prohibit unapproved apps from tracking employee location information. To compile the report, Flexera Software identified 25 popular dating apps, representing a small sampling of dating apps that can be found in the Apple App Store and that could easily be downloaded by employees to a corporate-issued or BYOD device. These apps were tested using AdminStudio Mobile, an Application Readiness solution that helps organizations identify, manage, track and report on mobile apps, simplify mobile application management, reduce mobile app risk and address the rapidly growing demand for mobile apps in the enterprise.